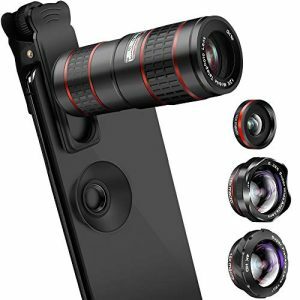 ▶STUNNING PHOTOS WITH DSLR LENS FEEL – The 9 in 1 perfect combination phone lens kit for taking travel snapshots, wide landscapes, close-ups, funny circular pictures,distance shooting,overlapping vision and unique selfies,giving you stunning images in brilliant quality. 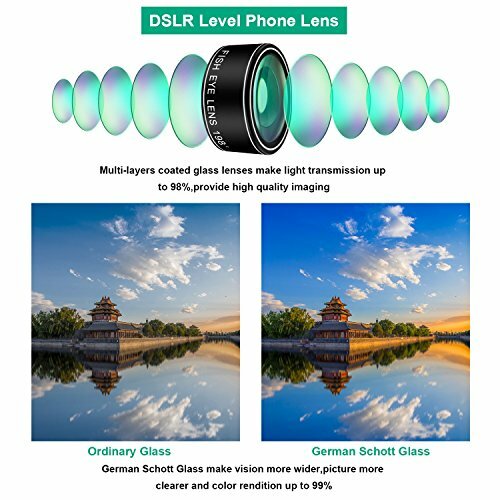 ▶CLEAR EDGE TO EDGE AND NO DARK CORNERS – Factory based company with professional engineers make the lens with world advanced German Schott Glass to minimizes lens glare, reflection and ghosting for superb clarity,make the picture distortion below 6%.Crafted with aircraft-grade aluminium to keep the phone lens lightweght. ▶DIVERSE IMAGE EFFECTS – Wide Angle lens is great for group shot.Fisheye Lens create funny circular pictures.Macro lens capture amazing close-ups.Telephoto lens for shooting distance pictures and blur the background.Starburst Lens to add a dramatic star flare to very bright areas.Kaleidoscope Lens show you 6 overlapping vision.CPL lens eliminate reflected light and create beautiful color. 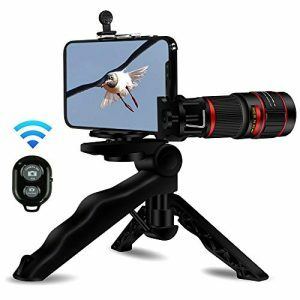 Kaiess HD 9 in 1 Cell Phone Camera Lens Kit Expand Your Creativity of Shooting Possibilities,Help You Capture Wonderful Moment of Your Life and get the MOST BEAUTIFUL pictures in the world.It’s a Great Gift Choice for Hobbyists and The Most Demanding Professionals. 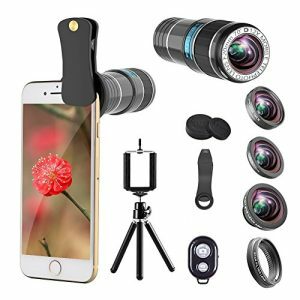 The Phone Camera Lens Kit includes 0.36X super wide angle lens & 20X macro lens,198°fisheye lens,2X zoom telephoto lens,0.63X wide angle lens & 15X macro lens,CPL,Kaleidoscope and Starburst lens. 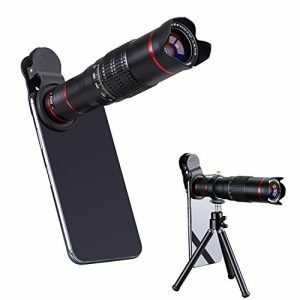 With over THREE years manufacturing experience and professional design team,Kaiess commit to offer customers high quality phone lens with competitive price. 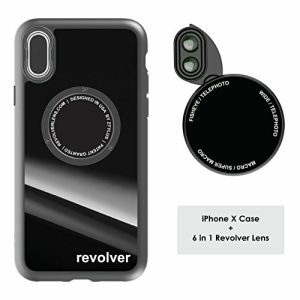 The Phone Camera Lens Can Fit for iPhone X,8,7,6s,6 Plus,Samsung Galaxy S6, S7, S7 Edge, S8, S9,HTC, Sony, LG, Google Phones, Huawei and Other Smartphones.Put it in Your Pocket and Go Out for Fun!Turn Ordinary Pictures into Artworks! 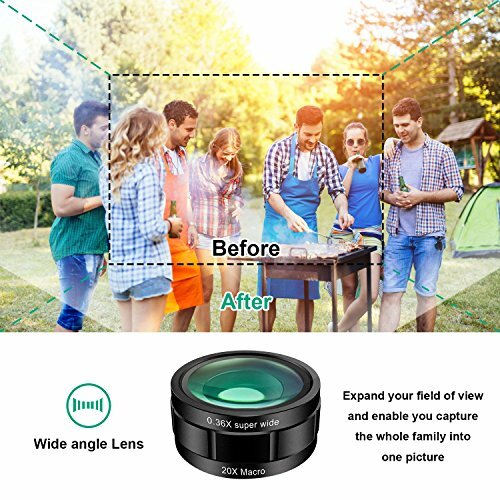 ✔Wide Angle Lens:Expand the field of view,capture larger scenes like city scene and group shot. 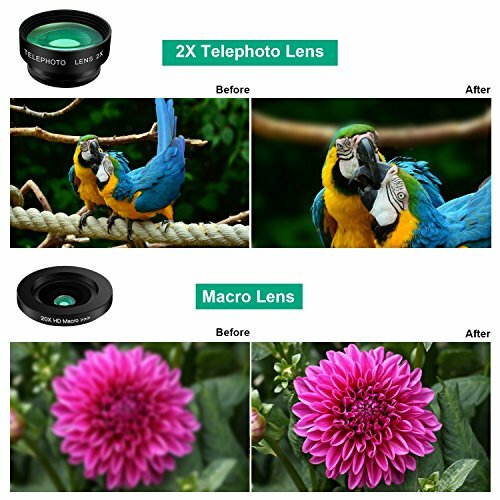 ✔Macro Lens:Take picture of small, close-up subjects with rich detail. 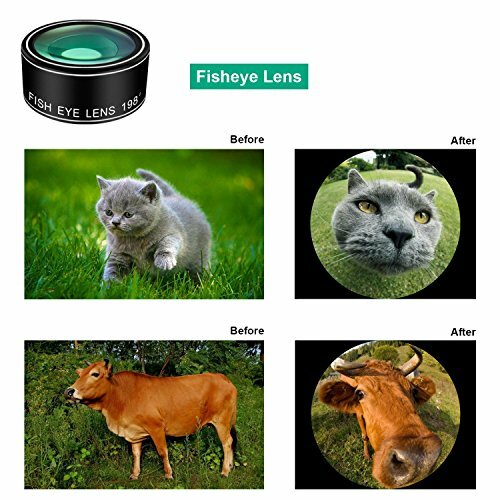 ✔Fisheye Lens:Great for you to take funny round picture,distortss the image to creat an artistic effect. 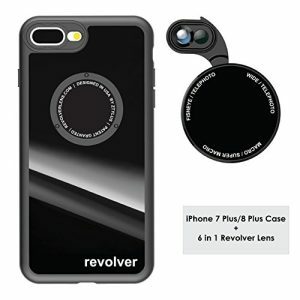 ✔Telephoto lens: Zoom in 2 times closer to the action,blur the background,great for Portrait photography. 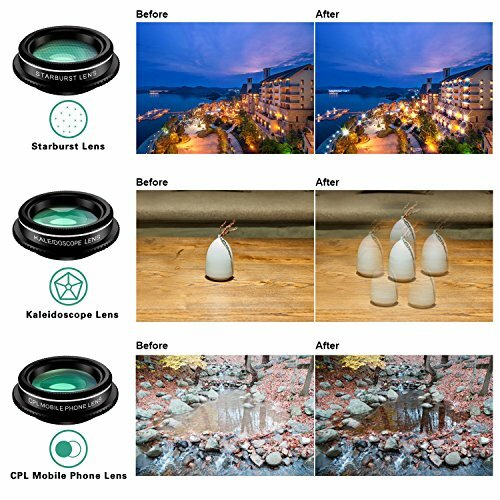 ✔CPL Lens: Remove unwanted reflections from non-metallic surfaces such as glass or water to enhance color saturation. 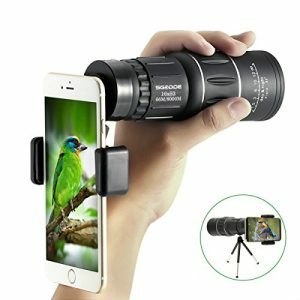 ✔Kaleidoscope Lens: Show you an overlapping vision. ✔Starburst Lens: Add a dramatic Star flare to very bright areas. 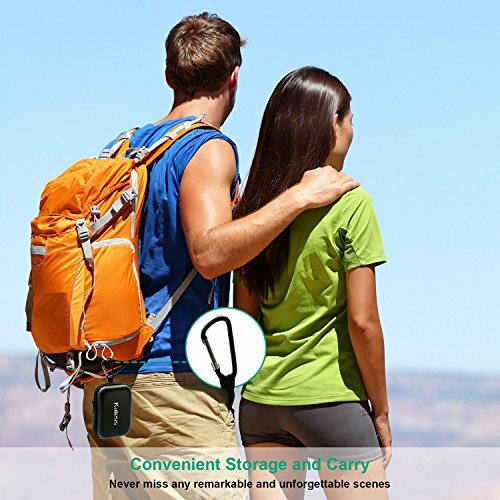 ▶EASY TO CARRY ANG GREAT GIFT CHOICE -Well-designed carabiner and carrying case make it easy for you to carry whenever you’re traveling or hiking.Detachable clamps is easy to adjust and won’t leave any scratches on your phones.It’s a great gift choice for you! ▶100% CUSTOMER SATISFACTION GUARANTEE – 30 Days Money Back and One Year Warranty. 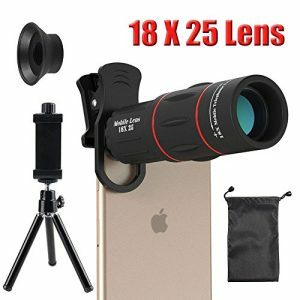 The wide angle lens and macro lens are screwed together. 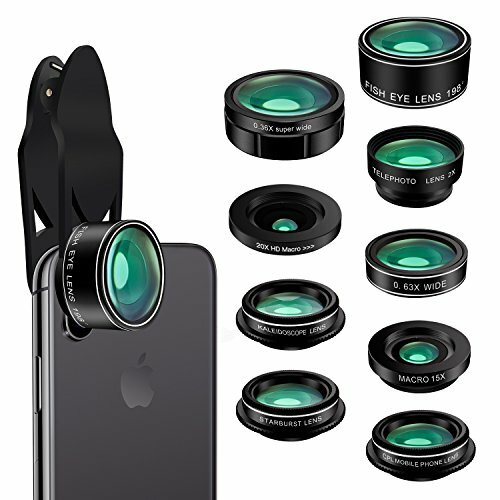 (NOT LENS MISSING).If you have any problems, do not hesitate to contact us,your satisfaction is paramount!